Note: this particular set comes in two variations, both more or less equally common. 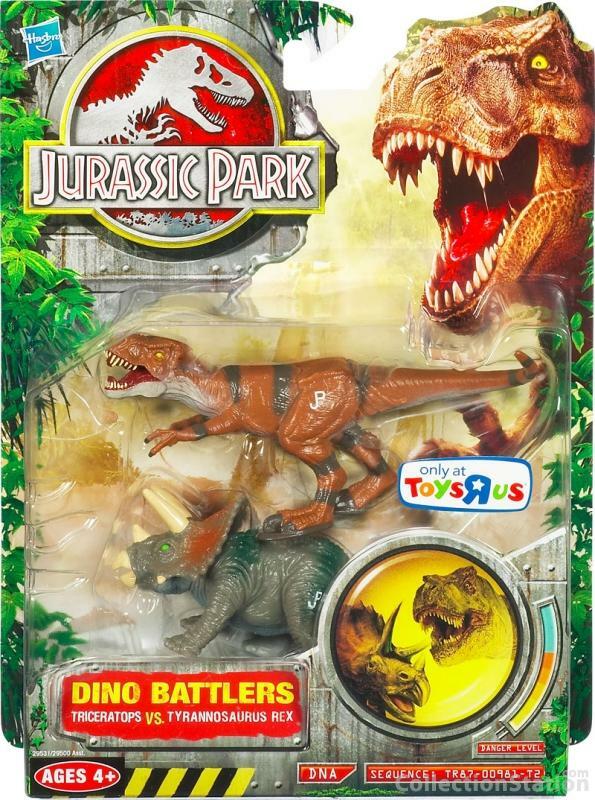 This review concerns the set with the darker coloured dinosaurs, which is generally regarded to be the original, while the set with the brighter coloured figures is usually seen as 'the variation' of the two. Description: the T-Rex stands in an aggressive posture, its head curved to the left and its arms stretched out. The tip of the tail is bent pointing upwards and to the left. It has small pads on its feet to give it extra support. While the underside (lower jaw, throat, belly and lower part of the tail) of the Rex is coloured white, the rest of the figure is painted light brown. The creature features two big dark brown stripes on its back, and a third at the base of the tail. Additionally, brown bands are found on the figure's lower legs (two each), arms (one each) and tail (three near the tip). The pads under the feet are painted in this same dark brown colour, as are the claws on both fingers and toes. The tongue and inside of the mouth are coloured red, while the teeth are white and the Rex sports small cat like yellow eyes with black pupils. It has a white JP logo on each upper leg. The Triceratops appears to stand in a brace-for-impact posture, its head (almost as big as its torso) held low to the ground (and slightly posed to its right), the front legs more or less in the same position, while the left upper leg is stretched backwards. The tail curves to the right. Most of this creature's body, including the head, is painted grey, while its underside (throat, belly and the first half of the lower part of the tail) is light blue instead. On its back and tail the figure sports some vague green spots, while a trio of red spots covers most of the head crest. The beak and the horns (including those on its cheeks) are painted beige. The Trike has small green eyes with black pupils and a white JP logo on each upper leg. Analysis: Dear Lord, not this T-Rex again! As if we haven't seen this sucker enough in the previous repaint lines, Hasbro thought it a good idea (or they likely just didn't care at all) to present us with this particular sculpt four more times in their JP 2009 line. This is one of them, and compared to some of its more zany repaints out there, its paint job is rather conservative, being a typical brown on top, white below and some dark stripes to complete it all. It's just not a very interesting or imaginative paint job. Also, it's a shame to see the claws on the feet painted in the same colour as the feet pads, since now it looks as if the two have melted together. The Triceratops also isn't a very successful release. After its surprising first appearance in JPD3, the shock of this most recently released sculpt has disappeared and it's now as conventional as the rest of these repaints. Its paint job is rather dull, though it uses much more very different colours than you might think at first glance (grey, blue, red, beige and two different shades of green). But the result just isn't very appealing. In combat between these two, the Triceratops would probably emerge victorious considering those nasty spikes which it could use to stake the Rex to death. The Rex just isn't much bigger and would have a hard time getting a good bite out of the Trike unless it took it by surprise. Whoever wins, as far as the quality of this two-pack goes, we lose. Repaint: yes. The T-Rex originally came with the Military General for the JP III line and has already been repainted over and over again for Camo-Xtreme, JPD2 and JPD3 and would be used several times again for this toy line. The Triceratops first popped up in JPD3 for which it was used twice. Its appearance on JP 2009 remained limited to this two-pack. Overall rating: 4/10. Not a very appealing set of paint jobs. The sense of 'newness' experienced for the Triceratops when it first appeared in JPD3 has waned, and by now everybody is really sick of this damn T-Rex. There's just nothing of particular interest in this set, unless you don't own either one of these sculpts yet (which in the Rex's case seems unlikely by now). This set is not rare (in either variation) and can still be found rather easily. Since this set was a Toys'R'Us exclusive that might change some day, but surely not for the next few years or so.